Providing beds and jobs to homeless individuals, helping sick children feel more at home in hospital, providing clean drinking water to Canada’s indigenous communities, funding and expanding Canada’s use of renewable energy, and providing safe homes for families escaping domestic violence were the social causes presented at the third-annual IKEA Sustainability Challenge finals on Dec. 1, 2017. Second-year Bachelor of Business Administration (BBA) students in the Lazaridis School of Business and Economics were invited to participate in the three-week competition. Finalist teams pitched to IKEA executives and business sustainability experts to win scholarship money and an interview for a summer internship at IKEA. Five finalist teams were selected from among 42 total teams comprised of approximately 200 second-year BBA students in this optional competition. 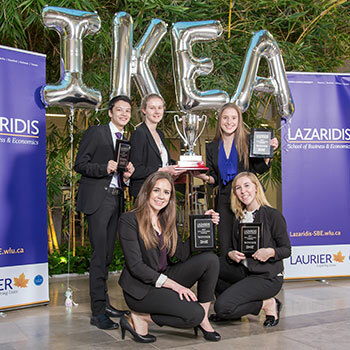 Twenty-two teams made it to the semi-finals and travelled to IKEA’s Burlington store to get information and inspiration for their second-round submissions. Then, the finalist teams were selected via a juried video pitch. After extensive debate and deliberation, IKEA executives and judges selected “Safe Home,” the team who presented that IKEA adopt and support an awareness and education campaign to reduce the stigma around domestic violence with future plans to build shelters for those affected. The team included Sophie Battaglia, Justin Eng, Shannon Lebarron, Erin Schilstra and Danielle Stregger. "Domestic violence impacts the lives of millions of Canadians," the team said in a statement. "However, it is very difficult for victims to receive the support they need because of the stigma that surrounds domestic violence. By having IKEA Canada stand behind this cause, we saw an opportunity to make a positive impact in the lives of so many Canadians, and we could envision a real solution." Team #IKEASafeHome reported that up to 25 per cent of IKEA’s employees and customers are affected by domestic violence and that no other major company in Canada supports this cause. The team suggested IKEA design an all-purple showroom during Domestic Violence Awareness month in October and change its iconic blue bags to purple during the month, to represent the colour of awareness against domestic violence during domestic violence month. The winning team members will each receive a $800 scholarship and an invitation to interview for a summer internship at IKEA. Each of the five finalist team members received a scholarship from IKEA for a total of $15,500 in scholarship awards. Initiated from an idea by Lazaridis BBA alumnus Mike Ward, manager, retail region North America and Scandinavia, IKEA, and sponsored by IKEA, this year’s competition asked students to propose a program to help IKEA align with an environmental or social cause to deepen its connections with its customers and communities to help it ensure long-term sustainability. IKEA has committed to sponsoring this competition for another two years.